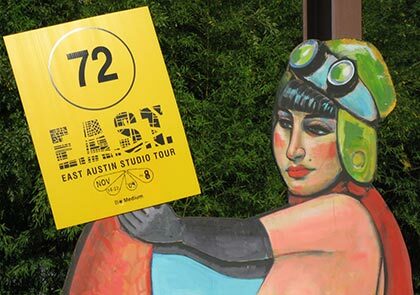 We had such a fun day on Saturday when we went for the annual East Austin Studio Tour. The tour is an excellent time to view art and get a behind-the-scenes look at where the art is created. This year there were 154 studios opening their doors to the public, events, and all kinds of other happenings. The best part is that now the tour is being held over two weekends, which is a great thing as there is just so much to see! I picked up some information on art classes and am looking forward to trying some new things next year. You know what I’ve been thinking about for a while? Printmaking and letterpress. I think those go very well with bookmaking don’t you? Anyway, aside from all the inspiration from the tour we also went to the bookstore in the evening and guess what I found, this magazine called Where Women Create. I’ve seen it before but I think I’d forgotten that it was going to be published on a regular basis. So this gave me more inspiration not so much on my crafty pursuits but more about how to organize my studio. Oh so many wild thoughts floating through my mind. So, I’m curious if you were to try a new art/craft technique, what would you try? Alright, I’m going to settle down with a good book for evening. I’ve done quite a bit of reading this weekend but I’ll tell you about those books in another post. I’m always in awe of you artsy people. I would guess you have more creative talent in your little pinky than I do in my whole body. I lack so much creativity, I can’t even tell you what I would do if I had my druthers! Sandy – Ah, I bet all that creativity is waiting to come out! 🙂 And, reading your last blog post I don’t think you have time for anything else! You amaze me what with all you get done. I need some of your energy! The East Austin Studio Tour sounds like a lot of fun, Iliana. Like Sandy, I’m not very artistic–except maybe when it comes to words, but even that’s a stretch. I love reading about your artsy endeavors. It gives me so much inspiration. I used to think like Sandy and Wendy, but the more you get out there and try stuff the more you realize how broad a word “creativity” is. An accountant can be creative in their job just like a painter. Keep up the cool stuff! What fun! I’d love to take a peek into some of those studios and be inspired about both the art and the space! What a fun weekend! I love going to open studio tours. I have also been thinking about taking a letterpress class and found something recently in NY and I am thinking about that for next year. I will be interested to see what you decide to explore! Maybe you can be on the tour next year! I want to try chair caning. More for practical purposes. There are so few chair caners left in the area. We have a a chair that’s not safe to sit on right now!! Wow! This looks like soooo much fun. I’m envious. 🙂 If I were to try a new craft it would probably be book binding! You’ve been an inspiration. What can I say? I have just tried felting in the last couple of weeks and really enjoyed it. I love learning new crafts. I would love to have a go at mixing glass colours by melting and making pictures with it. I think I’d like to try mosaic, or pretty much anything from Kirsty Allsops Home Made Homes series (yes even cake decorating because it looks more fun on tv than it was in school). Nikki – I agree. I think we can all be creative it’s just something that we have to cultivate. And, I cannot tell you how much inspiration I get from artists – it doesn’t matter what medium they work it, it’s more about the process. jenclair – we saw some great studios. I wish we could rent one out there too but well, maybe one day! Stefanie – I am always talking about wanting to try new things and it’s fun but you are right, there is just so much out there and frankly there’s just not enough time for it all. I would like something that complements bookmaking so that’s why I’ve been contemplating both of those for a while but we’ll see! Christine – Oh you should totally try it! I wish I had done the letterpress class at the Craft Guild in Dallas but I’m glad I’ve found some other venues here now and hopefully I can try one out. Yes, check out the magazine and tell me what you think! Andi – Ah, thanks girl. And, if you ever do decide to give it a try, go to the Craft Guild in Dallas – it’s in Addison and it’s fabulous. 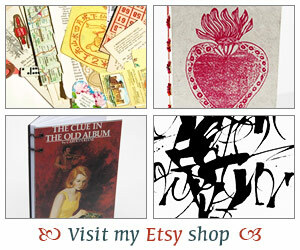 David is a fantastic bookbinder and you’d love his class. vivienne – Ooh felting sounds like fun. I love learning new things too (and buying supplies – haha). The glass melting and picture making sounds like it’d be fun! Thanks Iliana for another fun post. wow, sounds like you are going to have a creative new year.